Time to start working on the legs. 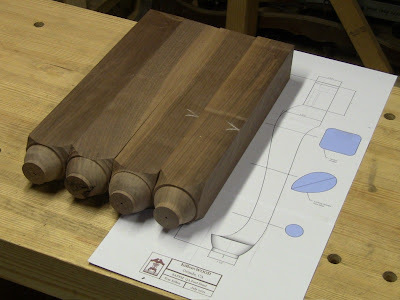 The first step was to turn the pad feet on all the leg blanks. This is a simple little shape on the end, while the rest of the blank remains square. Turning down the bottom of a foot. All four feet turned. Just don't take a caliper to all the pads. The drawing shows the cross-sections at several points in the legs. I did have to make an executive decision to cut the legs down an inch shorter than the plan. That was due to the original stock being just a bit short after working around a knot (naturally, in the worst possible place), and the marks from the lathe drive spur in the top ends, where they'll be visible to the world. That's why you make your rough cuts an inch long when you can, then trim it down later. Next was mortising. This is best done while the leg is a square block. That provides good flat surfaces for it to rest on. 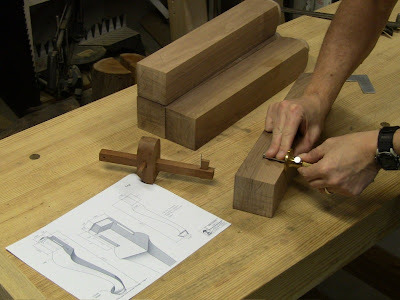 Mortising before trimming the post block also leaves the maximum thickness to avoid splitting. For the rest of this, I'll just be concentrating on a single leg. I'll also pass on several tips gleaned from Phil Lowe's articles and videos. Carefully marking out the post block cuts and mortises. I marked every scrap area with an X, because it's easy to get confused by all the layout lines and cut in the wrong place, especially given the offset width of the post block. 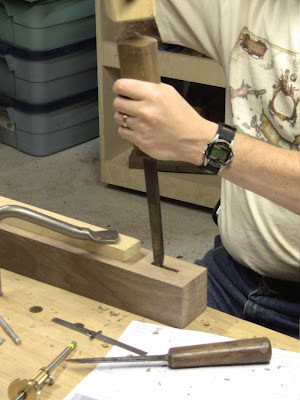 This Tite-Mark gauge can be rolled along to mark a mortise. 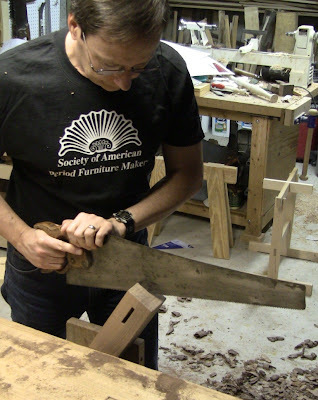 Mortising with a 5/16" oval bolstered mortise chisel, aka a pig-sticker. 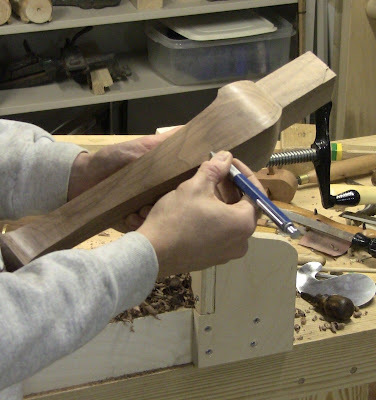 I used the narrower mortise chisel on the bench for cleaning out chips. Sawing down the post block cheeks. Per Phil Lowe, I stayed 1/16" to the outside of the gauge line. I'll clean the cheeks up after assembly, bringing them down flush with the rails. Making the post block shoulder cuts. 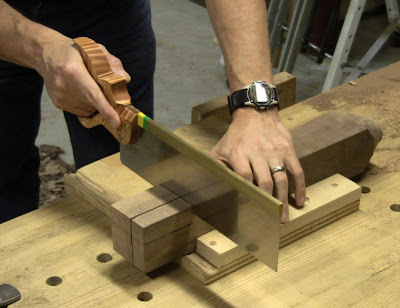 This is all very similar to sawing out a tenon. 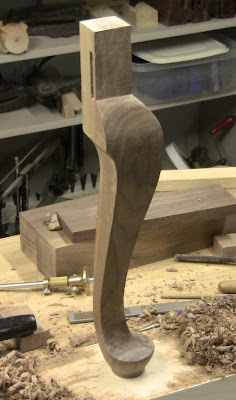 Now it's time to shape the legs. 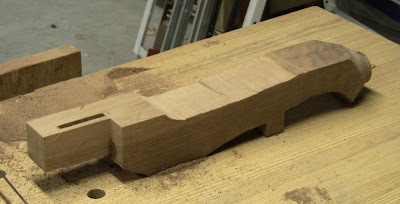 This starts with marking out the curves and rough sawing. 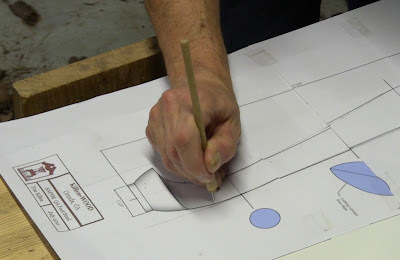 Phil suggests using a pin or needle in a dowel to mark out points through the full-size drawing onto a full-size template. Connect up the dots with a pencil, cut it out, and smooth down the edges. He makes his out of thin plywood. I used poster-board. You can see where I had to shift the pages of the drawing when taping them together and fair out the lines, to account for the shorter leg length. Tracing around the template on one side. Then rotate the blank, flip the template, and mark out the other side. I also marked both far sides so I could guide my saw exit. 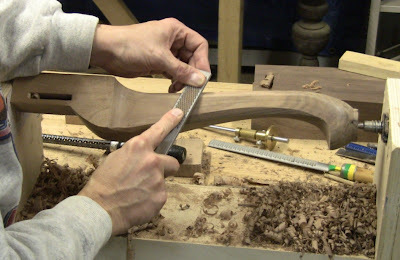 Sawing out the cyma with my shop-built Gramercy Tools bowsaw. This requires careful attention to the exit side of the piece. I'm using a section of 1/4" 6TPI thin-kerf bandsaw blade in the saw. The heaviest Gramercy blade is only 10TPI, so the bandsaw blade provides a faster cut. I was also worried about snapping the Gramercy blade in the thick cut, since it's just a long coping saw blade. The bandsaw metal works easily: score it with the corner of a file, and it snaps easily; then it drills easily for pin-holes. I used 18 ga. nails as pins to mount in the handles. The heavier blade does leave a wider, slightly rougher cut and doesn't make as sharp a curve, so I gave myself a little extra margin from the line. That of course means more cleanup work later. After cutting the first pair of curves. 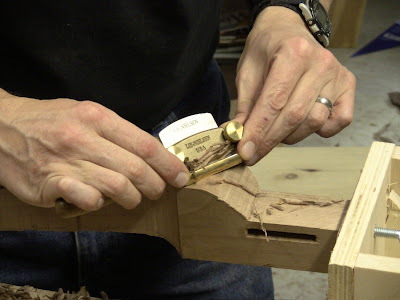 As Phil recommends, I left a little bridge for clamping up a square shape. I did find it helped to cut off bits at a time, rather than try to take continuous cuts as you would with a powered bandsaw. Then I re-marked the lines for the other pair of curves. This is where the flexible cardboard template comes in handy, rather than a plywood template. After cutting the second pair of curves. Is that a graceful turn of leg, or what? Ok, so right now that's an or what. 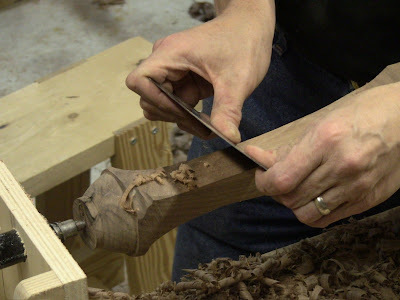 Time to refine the shape, using an assortment of spokeshaves, chisels, rasps, files, and scrapers. 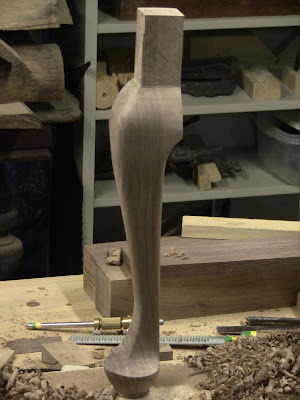 For this phase, I mounted the leg in my Al Breed carving vise. As Phil says, this work is very organic and sculptural, fairing the shape out, and no two legs ever come out exactly alike. 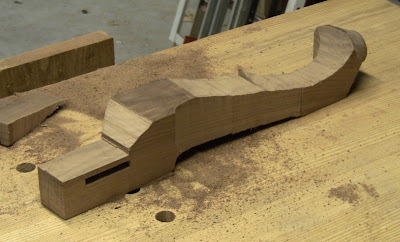 I used the old boatbuilder's rule: it's a fair curve if it looks fair. It's also very sensual, running your fingers along to check for bumps or ripples. It should be pleasing to the eye and to the hand. This was fairly time-consuming because I had cut well away from the line, leaving a lot to clean up. The real bear is working inside the concave curves behind the knee and on top of the pad foot. Those are just awkward spots to get a tool into, other than rounded rasps and files. You can just barely get a scraper into the arc. 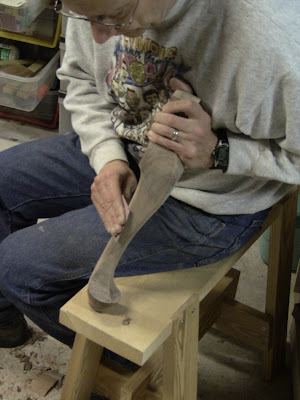 Using a chisel to shave down the transition behind the knee. I followed that with rounded rasps across the grain. I used a four-in-hand rasp and round Surform rasp. This was the slowest work. Spokeshaving down a side. 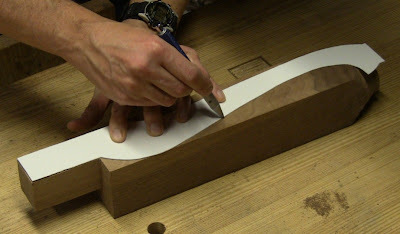 The compound curves mean the grain changes somewhere along the length, so you have to reverse the direction of shaving. 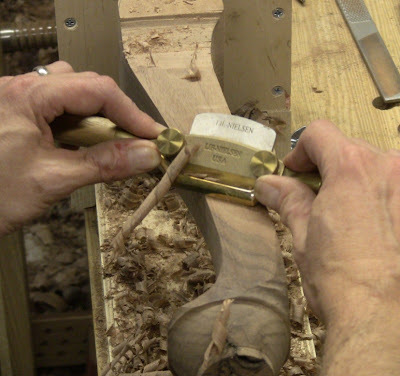 Using a scraper in the concave areas where the spokeshave wouldn't reach. The most difficult spot is the curve in the top of the foot. This walnut does shave and scrape very nicely, leaving an almost polished surface. All the sides smoothed out. You can see there's still a little waste around the pad foot. I carefully pared that down with a chisel. 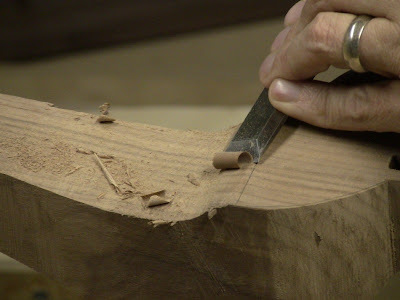 This area is delicate because it has a thin short-grain edge; being too aggressive with the chisel will cause it to chip out. After cleaning up the foot, ready for rounding off the sharp corners. Following Phil's instruction, marking sets of lines down each corner, using my finger as a guide. These mark the facets that will be rounded down. Look at how that scraped surface shines! Phil uses a chisel to chamfer the corner down to the first set of lines quickly, but I have better control with a spokeshave. It just takes a little longer. 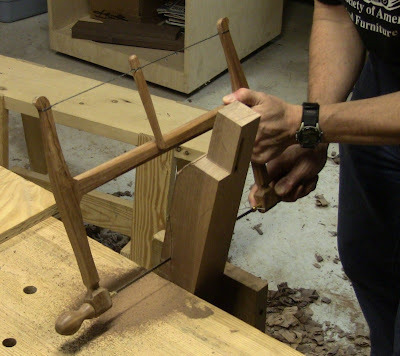 Using rasps to round down each arris to the next set of lines. I followed up with a file for a finer surface. It's almost a crime to take sandpaper to the scraped leg, but I needed to smooth down the filed corners and feather them in. I used 80, 220, and 400 grit papers. 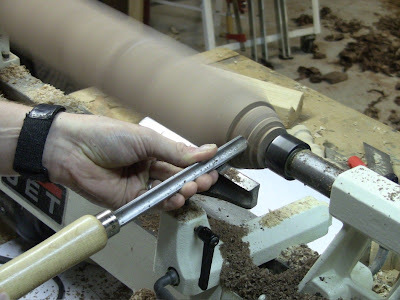 It's worth following the grain, not sanding against the grain, for the best surface. Now THAT'S a graceful turn of leg! As pretty as the leg turned out, I realized I hadn't checked it against the cross-sections on the plan. The thinnest part is still a bit squarish, and the center is a bit thick where the plan section is more of a feather shape. So I need to go back and refine those a bit further. I don't want it to be too clunky after I've spent all this time on it. I've already compromised the proportions a bit by shortening the leg. Now I just need to do the other three! That leg turned out excellent. 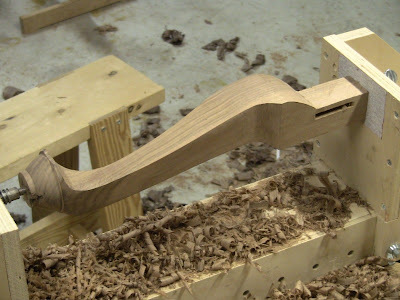 A future project involves cabriole legs, so I'll be following along. I recently made the switch from those 4-in-1 rasps to some Auriou rasps and I'll never go back. Thanks, Joe! I've got some Gramercy Tools rasps on the way. I'm really looking forward to using them. I'll do a little review of them in the next part once I've tried them out.